Why is Diffie-Hellman considered in the context of public key cryptography? In all textbooks I used the Diffie-Hellman key exchange is under "public key cryptography". As far as I can see it is a method to exchange a key to be used with a symmetric cryptographic algorithm, so it falls very naturally in the area of symmetric key cryptography. So where does DH stand in the split between symmetric and public key algorithms? The Diffie-Hellman key exchange is a public-key technology. It is (by itself) not an encryption algorithm (or signature algorithm), though. Each party calculates the corresponding public key $g^x$ or $g^y$. Each party sends the public key $g^x$ or $g^y$ to the other party. Each party uses the received public key together with its own private key to calculate the new shared secret $(g^y)^x = (g^x)^y$. The result of this key exchange is a shared secret, which is usually then used with a key derivation function (using other input known to both parties, such as a session ID) to derive a set of keys for a symmetric encryption scheme and MAC keys, if we aren't using an encryption scheme with integrated authentication. If we are building a bidirectional channel (like in TLS/SSL or SSH), we derive different keys for both communication directions. This might be what causes confusion: it is an asymmetric technology used to negotiate symmetric keys. But the same is valid for most other asymmetric technologies, like signature or encryption algorithms: At the core there is something asymmetric, but then we use a symmetric algorithm to do the bulk of the work. For example, with most asymmetric encryption algorithms we usually encrypt just a symmetric key for the actual message, with most signature algorithms we first hash a message, then asymmetrically sign the hash. The values $g^y$ or $g^x$ are named public keys, because they can be transmitted in plain, so anyone listening on the connection knows it. The values $x$ and $y$ never leave the choosers computer, so they stay private. $(x, g^x)$ and $(y, g^y)$ are the private-public key pairs here. Incidentally, these are the same types of keys as in DSA or ElGamal. One could have long-term key pairs (and then the public key could even already be in some address book, saving the transmission, or be signed with some certificate), but more usually these key pairs are created on the fly for each connection. The receiver has a private key $x$ and a corresponding public key $g^x$. The sender somehow securely obtains the public key $g^x$. The sender choses a temporary private key $y$ and calculates the corresponding public key $g^y$. The sender calculates $(g^x)^y$ and derives from this a symmetric key $K = f((g^x)^y)$. The sender encrypts his message: $C = E_K(P)$. The sender sends $(g^y, C)$ to the receiver. The receiver gets $(g^y, C)$. The receiver calculates $(g^y)^x$ and derives from this $K = f((g^y)^x)$. This is the same $K$ as before. 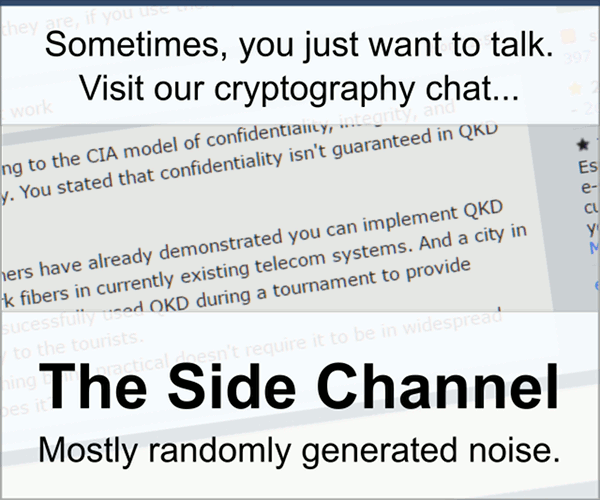 The receiver decrypts the message: $P = D_K(C)$. This is an asymmetric encryption scheme – to encrypt, the sender needs to know only $g^x$, while for decryption $x$ itself is needed. I would like to explain this with an example, that why it lies in public key cryptography domain. All the values used in this example (a = Private Key of Alice, b = Private Key of Bob, g, n, PKalice = Public key of Alice, and PKbob = Public key of Bob) are large, let say 2Kb or 4Kb, prime numbers. Let Alice and Bob (who don't know each other) want to communicate. They both have generated their private keys (let say 'a' and 'b'). Similarly, they both have calculated their public keys (let PKalice = g^a mod n, and PKbob = g^b mod n). The values g, n and public keys (PKalice and PKbob) are publically known and could be stored in a central repository. Now whenever the two users want to communicate, they can obtain the publically known and agreed upon values and can generate the session keys (symmetric key) and use that key for secure communication. For Alice, the function to calculate session key is (PKbob ^ a mod n) and for Bob (PKalice ^ b mod n), that result in the same value for Alice and Bob, although they don't know each other private keys or values. Not the answer you're looking for? Browse other questions tagged public-key symmetric diffie-hellman terminology or ask your own question. Why do we need Diffie Hellman? Explanation of the Decision Diffie Hellman (DDH) problem. Can Diffie-Hellman generate values in a specified range? Where did Martin Hellman acknowledge Ralph Merkle's contribution to public-key cryptography? Why is Diffie Hellman used alongside public keys? Why is a Diffie-Hellman key exchange required when RSA is already being used for key exchange in TLS? Why is RSA preferred over Diffie-Hellman if they're both used to establish shared key?